San Francisco prospered by supplying prospectors in the 1849 Gold Rush and grew from 820 residents, two hotels and two wharves, to more than 300,000 in the late 1880's. In 1852, the horse-drawn "Yellow Line Trolley" was the beginning of public transportation. Many of San Francisco's hills were too steep for horse-drawn trollies, creating a need for the concept of cable traction used in the gold mines. 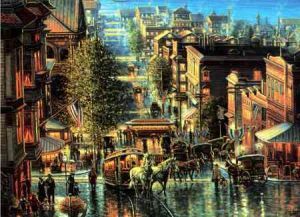 This painting captures San Francisco in transition from the horse to the cable car. San Francisco had truly come of age.